Over the last few years Secon have worked on many Medical and Dental Centres throughout Australia. This newsletter shows our extensive experience in the area. Currently in design for Primary Health Care is this medical centre located in Brookvale, NSW. The new medical centre will incorporate medical theatres, recovery beds and recovery chairs on the ground floor. The first floor will incorporate a chemist, dental surgeries, physiotherapy beds, GP rooms, GP treatment beds, specialist clinic rooms, specialist surgery rooms, radiology ultrasound rooms, radiology X-ray, radiology CT scan, optical consulting rooms, optical testing rooms and an optical laser theatre. Top Image - An example of the 2D plans, sections and elevations from architects Tim Shellshear and Associates. 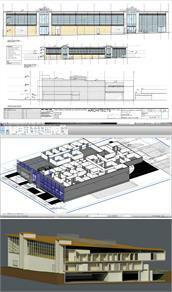 Middle Image - Secon preliminary internal Revit model. Bottom Image - A rendered drawing from Revit. A new Primary Health Care medical centre incorporating a chemist, physiotherapy beds, dental surgeries, X-ray, CT scan, ultrasound scans, GP consulting rooms, specialist consulting rooms, medical treatment beds, pathology and electrocardiogram room. The centre will incorporate many ESD initiatives including economy cycle, C02 monitoring of outdoor air and a VRF heat reclaimed domestic hot water system. 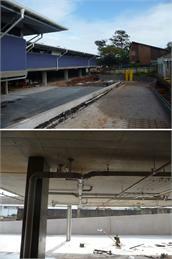 This project comprised the fitout of 2 floors of a new 4-storey building. The centre includes radiology and pathology for Primary Heath Care. 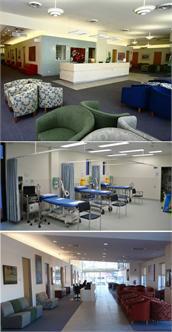 The fitout incorporated pathology rooms, X-ray room, ultrasound areas, CT gantry and mammogram. Due to the limited power on site the air conditioning system incorporated gas driven VRF condensing units. A new medical centre with GP medical suites, dental surgery, audiology, MRI, physiotherapy, chemist and vacant tenancies for future medical services. The services Secon provided include Mechanical, Electrical, Electronic, Hydraulic, Fire and ESD services. A tenancy fitout for Primary Health Care in a new multi-storey building. The ground floor tenancies incorporated an X-ray department, MRI and ultra-sound. This project was recently completed. Stage 1 was completed in 2005 and incorporated specialist rooms, GP medical suites, dental surgeries, physiotherapy beds, ultra-sound, X-Ray, CT scan, OPG, pathology, treatment beds, ECG and a pharmacy. Stage 2 which was recently completed included the conversion of the chemist and adjacent tenancy into pathology and additional 5 GP rooms. The services Secon provided include Mechanical, Hydraulic and Fire services, including air conditioning, general exhaust, medical exhaust, compressed air and suction. Extension and refurbishment of an existing building into a new Primary Health Care medical/dental centre. This project comprised the construction of specialist rooms, GP medical suites, dental surgeries, dental consulting room, physiotherapy beds, ultrasound areas, X-Ray, CT, pathology, treatment beds and a pharmacy. The Secon provided include Mechanical, Hydraulic, Fire and ESD services, including air conditioning, general exhaust, medical exhaust, compressed air and suction. A Primary Health Care refurbishment of an existing building into a new medical and dental centre which includes a pharmacy, GP medical suites, specialist rooms, physiotherapy beds, as well as dental surgeries, pathology, treatment beds and an ECG. The services Secon provided include Mechanical, Hydraulic, Fire and ESD services, including air conditioning, general exhaust, medical exhaust, compressed air and suction. To view last newsletters image for the 'Caption Competition' go to http://createsend.com/t/r-BF6006BF70DEF14D Well done to Chris from 'Chris Mantle Electrical Contractors' who came up with the wining caption for our last newsletter image of "This is an obvious cover-up by the plumbers...They've made a mistake, then taken the photo upside-down to cover it up." The runners up were Geoff from 'Geoff Jarvis Architecture' who came up with "short-sheeted", and Kym Fuss of 'Wilde and Woollard' who came up with "Which architects didn't close the lid on door heights." A bottle of wine is the prize for the person who comes up with the best humorous caption for this security camera image.